Just in time for Earth Day (April 22), Jutta Seibert, coordinator for Academic Integration; Merrill Stein, Social Sciences liaison team coordinator; and Joanne Quinn, graphic designer, collaborated to create the “Environmental Programs at Villanova” window display. While the specific events are over, the exhibit itself provides information and food for thought far beyond the dates of the events. A large poster to the left provides information about “Environmental Programs at Villanova: Majors & the Concentration.” On the right, another poster lists “Environmental Courses” and “Environmental Fields.” A campus map in the lower left corner shows the locations of green projects. Two digital picture frames publicize University-wide faculty research on the environment as well as environmental e-resources (journals, dissertations, theses, Community Bibliography, JSTOR) available through Falvey Memorial Library. Faculty from many departments beyond Geography and the Environment—Theology, Philosophy, History, Engineering, Chemistry, Nursing and Business—have addressed environmental issues. Jutta Seibert noted that faculty from all colleges and most departments are represented. 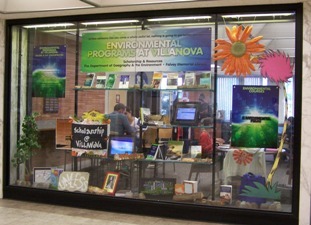 Numerous books on various environmental topics fill the window. Two of these are particularly interesting: Rachel Carson’s Silent Spring, now in its 50th anniversary, and a colorful children’s book by Dr. Seuss, The Lorax. Silent Spring, published in 1962, was widely read and instrumental in launching Earth Day and the environmental movement. 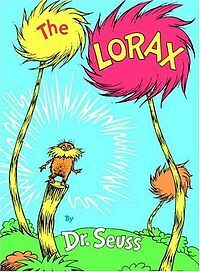 The Lorax, a fable set in a polluted world caused by the Once-ler’s cutting down the truffula trees, tells the story in language appropriate for children. The window display includes various references to Dr. Seuss’ book: the truffula tree to the far right (balanced by a real tree on the left), the Lorax holding a container labeled “Scholarship at Villanova,” and a stone ominously inscribed “UNLESS [someone cares for the environment],” the message the Lorax left before he disappeared. Come visit the exhibit. Take time to view the slide shows, examine the range of courses, books and e-resources available and be inspired to do your part for the environment.